Located in Northeast Tallahassee adjacent to Killearn Estates along the Thomasville Road corridor, Shannon Forest is a hidden gem offering homes far below replacement cost in a highly desirable location in Tallahassee. If you are looking for a "best buy," Shannon Forest could be the "real deal.". Values are still below $100 per square foot, which is crazy good for a home that would cost over $100 per square foot, plus land, to replace. 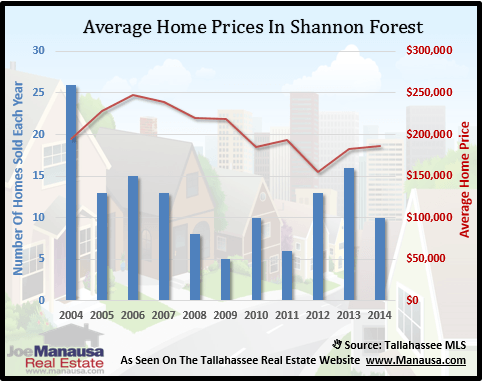 In this report, we will look at prices, values, and sizes of homes in Shannon Forest, as well as show current listings in the Tallahassee MLS and all closed home sales going back to 2002. For all of the real estate graphs found below, we have recorded the number of closed home sales for each year (blue columns, measured on the left vertical axis), and an important real estate statistic shown in red (measured on the right vertical axis. It is important to note that sales are through December for all previous years, but through mid October in 2014. Home prices have risen slightly this year, following a year of rapid gains after hitting a 11 year low in 2012. The average recorded sales price is $186,000 for Shannon Forest thus far in 2014, and you should expect it to be above $200,000 in 2015. The pace of home sales, while slightly lower than the previous two years, appears to indicate a recovered market. Other than the record year of 2004, the current number of sales is consistent will all years since. Thus far through October, there have been 10 closed home sales in Shannon Forest. Average home values in Shannon Forest have risen two years in a row, up from a record low set in 2012. Much as we have seen from other neighborhoods in Tallahassee, values are still far below the cost of replacement, which means that existing home sales are likely to remain buyer favorites for another year or longer in neighborhoods like Shannon Forest. 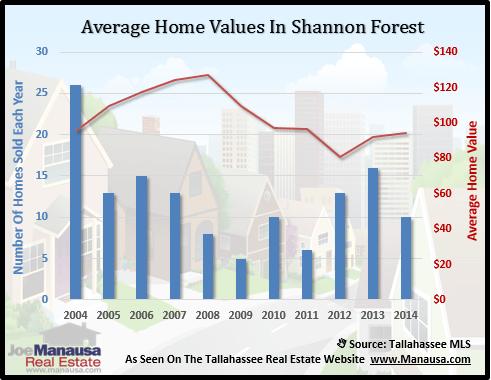 Through mid October, the average value of a home sold in Shannon Forest this year has been $94 per square foot. This is about 30% cheaper than it would cost to build an equivalent sized home in the neighborhood, encouraging buyers to be shopping for great values right now. 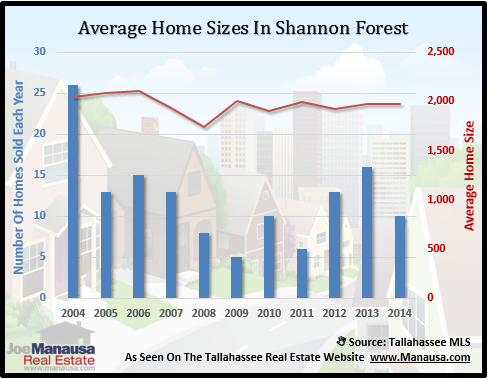 The average home size sold in Shannon Forest typically falls in a range of 1,700 to 2,100 square feet, and this year is no different. The 10 sales thus far in 2014 have averaged 1,973 square feet, and this average has not changed significantly over the past five years. The following list of homes are the most recent listings in Shannon Forest. The following list shows home sales going back to 2002 in Shannon Forest. I hope you enjoyed our October 2014 update on home sales in Shannon Forest, please feel free to drop me a note if you have questions not covered in this report.